Before you get worried, this type of trap won't hurt anyone but it will expand their mind and abilities! Sometimes it's hard to do an official "day" of Mother Goose Time lessons and activities. When that is the case I have a lot of fun setting up "toddler traps". I actually call mine "Adam Traps" because that is my intended target around here. He is my 3.5 almost 4 year old little man. So maybe, I should officially call him a preschooler, but I still struggle with not calling him baby Adam, so one step at a time please. There are many names for what I call "Adam traps". Some call them Investigation Stations or Invitations to Play. 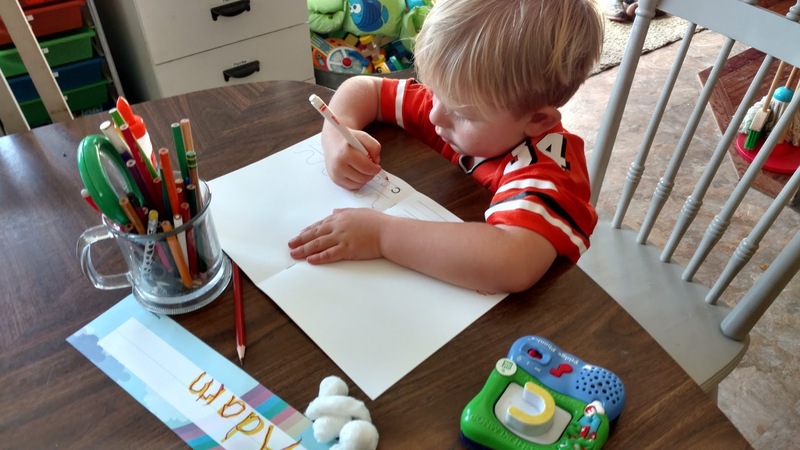 It's a pretty simple concept, you set up an activity in a special location for the child to find and investigate on their own. This is good for my Adam who has always been very independent. 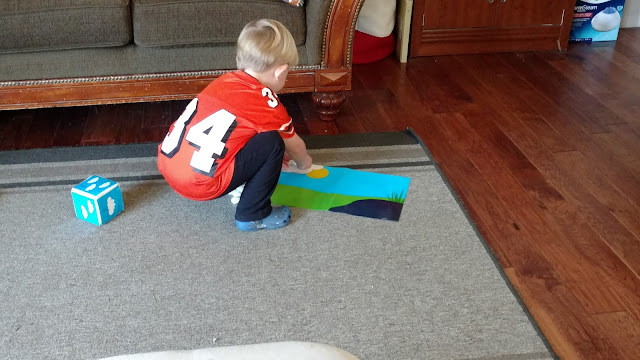 When he happens upon an activity and he chooses to investigate it further you can just see him beaming with pride and he has a lot more commitment to the task when it was his decision. Here is what you do. First you set out an activity at one of their spots or you set it up on the floor or somewhere that will catch their eye. Here is the first "trap" I set. I put out this Mother Goose Time math activity. We had done this once before so I knew he would know what to do. 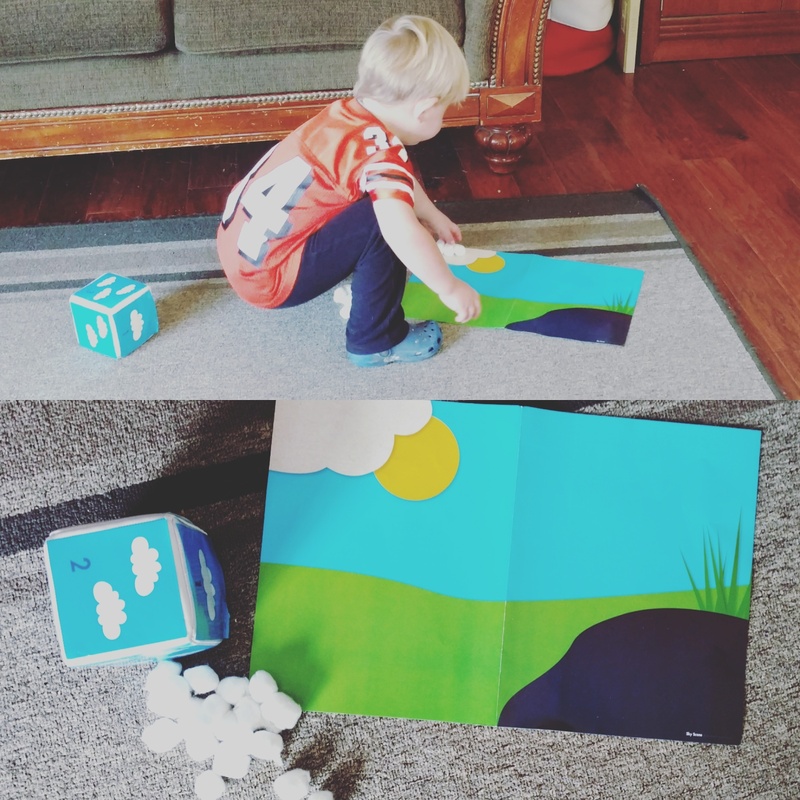 The objective is to have them roll the pocket cube and then put that many "clouds" (cotton balls) in the sky on the paper. The second trap I set was at the table. 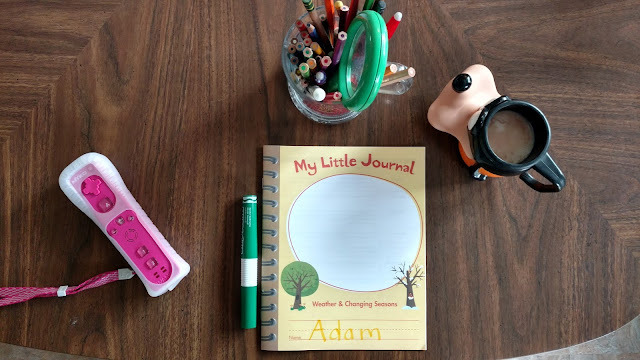 I put his My Little Journal on the table with his name written in yellow. We have done this a few times now, so again, I knew that he would know what to do. 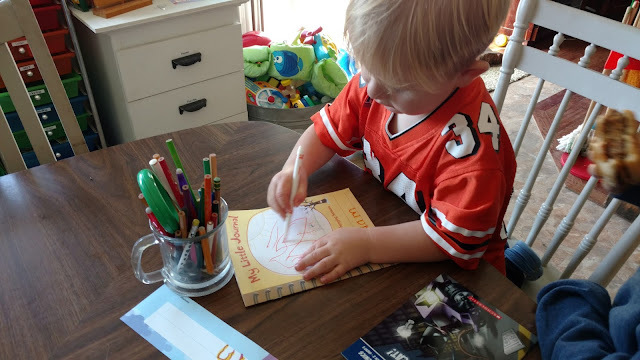 I set the green marker next to the journal and he knows to trace his name. I also included colored pencils so he could draw a picture on the cover if he wanted to. You can also see his chocolate milk is sitting there and his favorite Wii controller. I figured he might just climb up to the table to look for those items and discover his journal and I would catch him in my trap. It didn't take long until the first trap was successful. Caught him! I didn't want to scare away the toddler so I just took a quick picture from behind. A little while later I was able to get him to participate in the second trap. But I had to make it more enticing. I sat down at his spot and asked him to tell me his favorite weather. This was the journal prompt for the cover from Mother Goose Time. He said the sun and I asked him what he liked to do in the sun and I started to draw a stick figure drawing of Adam flying a toy airplane outside in the sun. He of course wanted to join in and then took it from there. He wrote his name first. 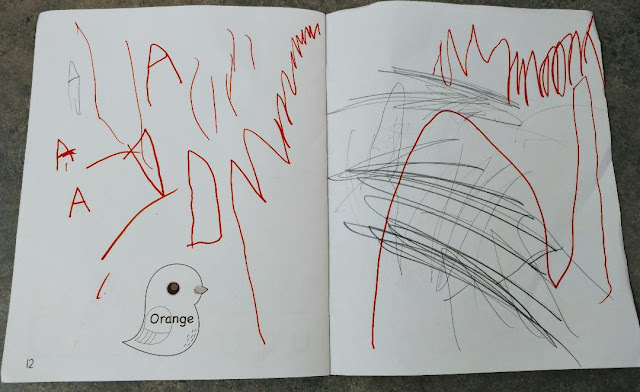 Then he added his own touch to the cover photo. The key is, I did not ask him if he wanted to participate because it's too easy for a toddler to say no. I just got him intrigued and because it was his decision he was totally invested. He did page after page in his journal. He wrote beautifully! Big Cs and little Cs. I love how these My Little Journals have the letter and then shapes or lines that, if practiced, will help in the formation of the letter. 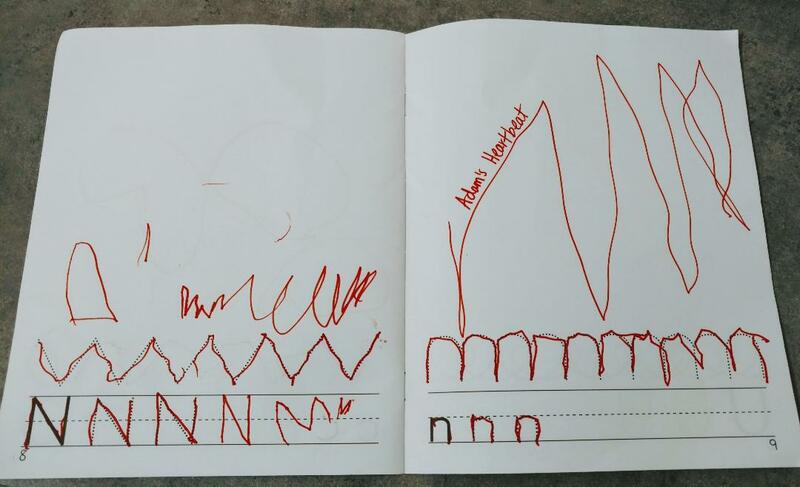 On this page Adam drew his "heart beat" because we were at the hospital the weekend before because of a severe case of croup. They had him on a monitor and we watched his heart beat. On the very last page Adam was determined to write his very own A, with out tracing. 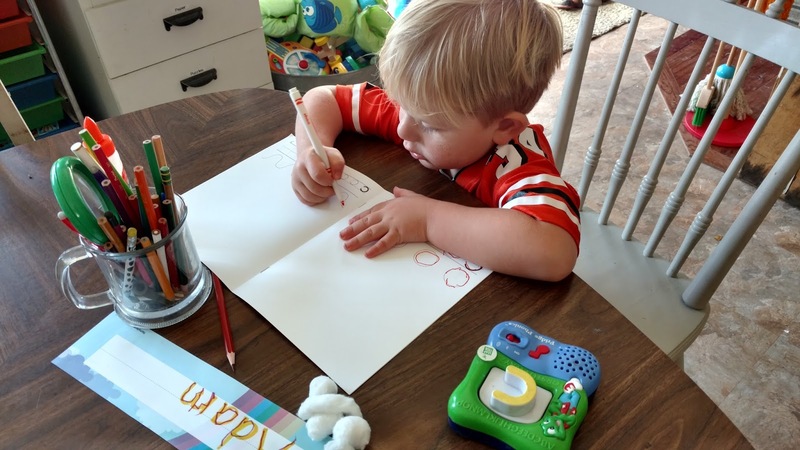 I gave him some step by step guidance through writing the letter on his own. 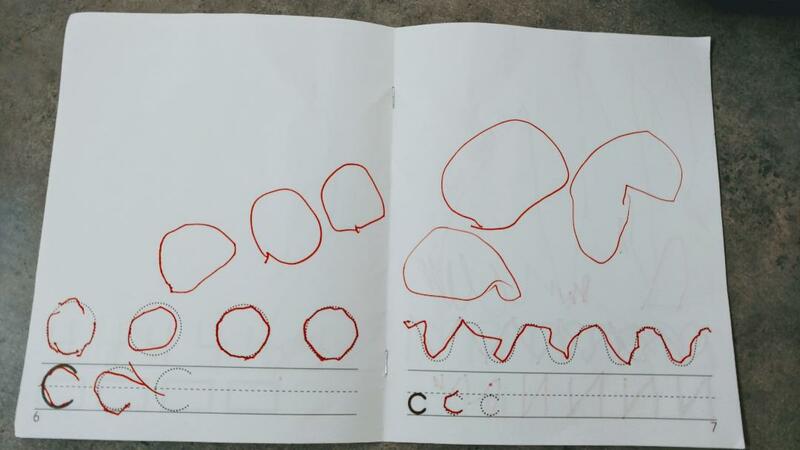 "Line up, then down, then frog jump, and draw a line across." 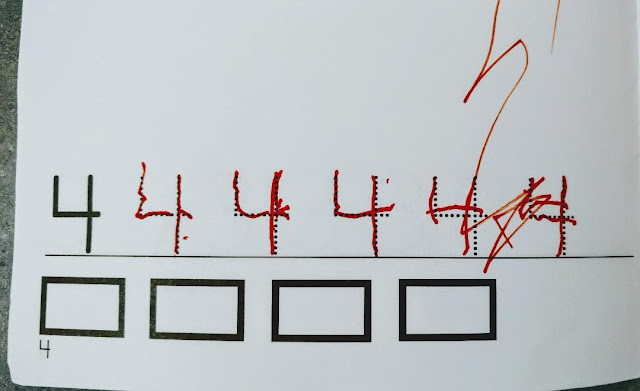 He did a few that looked more like a triangle and then nailed his very own and very first A!! You can find your own "Toddler Traps" on Pinterest, there are thousands of ideas. Look for keywords of Invitation to Play, Investigation Stations, or Toddler Tray Play. 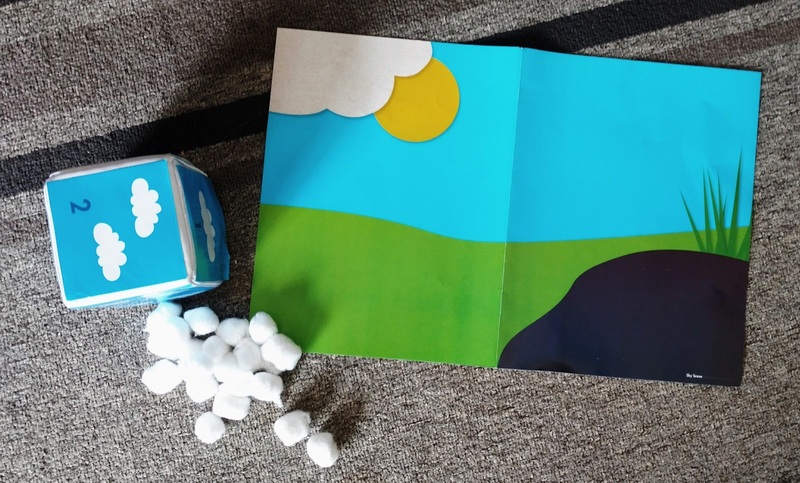 Of course, you can make it super simple on yourself and order a box of Mother Goose Time where all the Pinterest ideas are brought to life with stellar graphics, great printing, and delivered right to your door. Not to mention the fact that they are guaranteed to be educational and easily adaptable to your child. It's up to you of course and your budget, but I promise you won't regret it if you do decide to buy a box. Either way, set a Toddler Trap for your little one, and see what happens!